Question #6 – In which inning did Kranepool pinch hit? 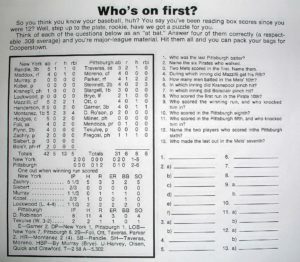 Answer – Kranepool’s pinch hit appearance was in for Kobel, who got the final two outs in the Pirates’ half of the 8th. Thus, Kranepool pinch hit in the 9th inning and made the final out of the inning.